If you regularly go on trips, then it makes sense to buy yourself one of the top-notch roof cargo boxes that can make storing things simple. These convenient storage boxes go right on top of your car and they can hold quite a bit of cargo. It makes it easier to take more luggage and other types of items with you wherever you are going. You may not always have room inside of the car or in your trunk for all of the luggage that you want to take so using the roof cargo box can be incredibly beneficial. Being that the cargo box is on top of your car roof, it is going to be exposed to the elements regularly. You will be taking it down and storing it away when it is not in use but it can still get pretty dirty driving the road during your trip. You want to make sure that you are cleaning it properly before you tuck it back away wherever you are storing it. To help your roof cargo box to last a long time, it is important to clean it properly. Understanding how to clean a roof cargo box should not be too difficult for most people. As long as you use common sense methods, you should be able to keep your cargo box nice and clean. 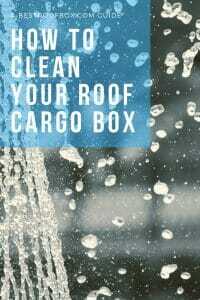 Here’s our guide on cleaning your rooftop cargo box so that you can get it right every time. It is very likely that your roof cargo box is going to get extremely dirty after being taken on a road trip. Combine this with the fact that many people take these cargo boxes with them on camping expeditions and you can see why the cargo box is going to need a good cleaning. When you know how to clean a roof cargo box in the proper way, everything is going to go fairly easily. You want to start things off by applying a good cleaner to the surface of your cargo box. This all-purpose spray-on car wash should wind up working out nicely. It will help you to get your cargo box very clean and it will leave it looking nice and shiny. This should be safe to use on the roof cargo box too so you will not have to worry about it causing you any problems. For the most part, if a cleaning spray is safe for the exterior of your car, it is likely going to be safe for the roof cargo box. You just want to avoid sprays that are too corrosive as they may cause damage to the exterior of your roof cargo box. Most of these cargo boxes are going to be made out of plastic so you won’t want to use anything that is too acidic. The cleaner mentioned above should work swimmingly so give it a shot. Using simple soap and warm water should also suffice. Just make sure that you have enough cleaner or soapy water to cover the entire roof cargo box. It is also crucial to pay attention to what type of towel you are using. Much the same as when you are wiping down the surface of your car, you do not want to use just any towel. For the best results, using a microfiber towel will be ideal. These towels are very soft and safe for your car and will work excellently for the roof cargo box as well. It will prevent you from accidentally scuffing or scraping your cargo box in any way while you are wiping it. This set of anti-scratch microfiber towels should work out very nicely for you. This set comes with many towels that will also come in handy for wiping down your car when you give it a thorough cleaning. Towels such as this are even completely lint-free so they do not leave behind any annoying fuzzy bits that won’t come off. You will have the smoothest experience possible if you choose to use good microfiber towels to wipe down your cargo box. Knowing how to clean a roof cargo box will allow you to keep it in good shape. Try to wipe it down completely so that you can scrub off any grime. Over time, these cargo boxes can get quite dirty. There may be stains from bugs or even just ample amounts of dirt from the road. Scrub it down completely and it should look as good as new when you are done. Now you need to go ahead and rinse your cargo box as thoroughly as you can. Grab your hose and gently rinse it so that you can get any straggling soap or other bits of residue off of the surface. It should not take long to rinse things down and you will be able to clean things up completely. After rinsing, you will want to go ahead and grab a fresh microfiber towel. Your microfiber towel will be used to help dry off the unit. Simply wipe it down with the towel again to help remove the water. You don’t have to be as meticulous this time but it is important to use a fresh towel. Once you are done, the roof cargo box should look pretty good. You are just about ready to store your roof cargo box but you will want to let it dry completely first. Using your towel to help dry it will make a difference but you should let it sit for a while before moving it. This can help you to avoid getting things wet wherever you are putting it. Find a safe place to let it dry where it won’t get dirty and let it sit for a little while. It won’t take too long for it to be dry, so you will be able to move it pretty swiftly. Now you will want to go ahead and store your cargo box in a safe place. Many people choose to store their roof cargo boxes inside of a garage or a barn. This will keep it out of the elements and will help to keep it looking its best for as long as possible. If you want to have the best experience, then it makes sense to place it in your garage or barn. It might also be best to go the extra mile and cover it using a tarp. You do not want animals or the sun to harm your roof cargo box while it is not in use. Taking the time to cover it with a tarp will keep it protected from the harmful rays of the sign and it will prevent random dirt from getting on it too. If you have a tarp sitting around in your garage, then you can put it to good use here. Wrap your roof cargo box up tightly in order to keep it safe. You should try to also tuck it away in a corner where it will not be bothered. If you have a spot in your garage or barn that does not get a lot of foot traffic, then placing it there is highly recommended. The goal of cleaning and storing your roof cargo box is to keep it looking nice and to allow it to be used for as long as possible. Going the extra mile when storing it will help to give you the best possible results. You might want to check out our recent guide on how to store your roof cargo box. You may also want to consider trying to restore your roof cargo box if it has become sun-faded in any way. The sun is a very powerful thing and it is going to fade your roof cargo box over time. The sun is not something that you can avoid while you are using it so the fading is going to occur. You can choose to help restore your roof cargo box by using polytrol, though. Now that you know more about how to clean a roof cargo box, you should have a far easier time. Maintaining your cargo box in the right way will help you to make it last for as long as possible. As long as you ensure that you have the right tools to use, you will always have a very simple time when doing the cleaning. It just needs to be cleaned as thoroughly as possible to keep it looking nice on your car. Wiping it down in the safest possible way really does make a difference. Storing it in the right spot that will keep it safe matters as well. You can even restore your cargo box if it has been faded by the sun over time. When you take care of your roof cargo box to the best of your ability, it is going to look really good.